It’s a fact: innovation doesn’t take place by coloring inside the same lines each generation before has. Sure, you can get really good at doing the same old thing, but it’s building on the solid efforts of those that came before you that really drives innovation. Just like Henry Ford revolutionized the auto industry, tools come out every year that defy the previously known boundaries. Some innovation is small – the addition of a small percentage of a compound that increases the strength of steel. Some are large – a cordless tool that drills through concrete as fast as a corded model. Some are revolutionary – smart tools that can communicate with and be controlled by a smart phone or tablet. They all have massive implications. Each one is a step forward in creating tools that are more efficient, last longer, and do what has never been done before. They’re also the stepping stone for the next generation of innovation. 2015 saw the introduction of smart tools that can communicate with devices outside themselves. We’ve seen three cordless drills exceed 1000 inch pounds of torque. 18V Lithium-ion batteries hit 6.0 amp hours, then jumped to 9.0 amp hours. Workwear is reaching levels of comfort and durability that we didn’t think possible ten years ago. Impact rated accessories are really starting to get dialed in to everyday fastening applications. These tools represent regular guys that had an idea to run with. These are the realized solutions of highly funded research and development teams. They’re the concepts brought to life by people that knew there was a better way to get the job done. They’re the first, second, and third steps of what engineers and product managers intend to take on a thousand mile journey. These are the your winners for the 2015 Pro Tool Innovation Awards! 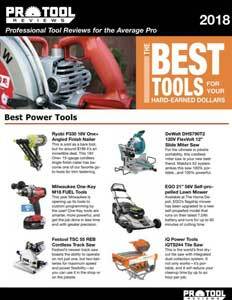 Big thanks to Kenny and the PTR team for a excellent selection of tools in this year’s awards! And congrats to all the winners!